It's been a year since we've seen a new Audi S4 sedan reach US shores. However, it was certainly worth the wait. Audi has announced that the S4 sedan will return to America carrying a price tag of $45,900. The price reflects Audi's initiative to make the S4 sedan a solid competitor against the BMW 335i and Mercedes-Benz C350. Of course, we feel that there's no comparison (but you knew we'd say that). All kidding aside, with a supercharged 3.0T V6 pumping out 333 horsepower and 325 lb/ft of torque, the 2010 S4 should scream past the competition. When equipped with a 5 speed manual transmission, the new S4 clocks 0-60 mph in 4.9 seconds (vs. 5.3 sec of the previous 2008 model). 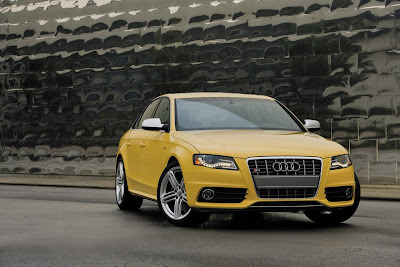 In addition to added performance, the 2010 Audi S4 sedan also boasts better fuel consumption. The 2010 Audi S4 manual achieves 18 mpg city and 27 mpg hwy. Certainly a large step above the 13 city/20 hwy of the 2008 model. Look for the new 2010 Audi S models to start hitting US showroom later this month (August).